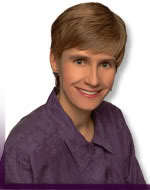 Author Patricia Bray is a rising star in the epic fantasy genre. With 10 books to her name in two different genres, she’s managed to carve a successful career among fantasy’s notoriously fickle readers. We spoke to Patricia to learn how she was able to break out of the box of category romance and into the juicy world of swords, quests, and high body-counts. Q: You got your start writing Regency-era romances for Kensington Publishing. Can you tell us a little bit about what drew you to the genre and what you learned from writing category fiction? A: The publishing industry often tries to categorize writers into neat genre pigeonholes, but I’ve never felt that way about my writing. When I began writing for publication, I considered several genres before deciding to write a Regency romance. I had been a fan of Regencies since college and felt drawn to these stories, with their emphasis on witty dialogue and strong characterization. The scale was also a factor, in that writing a 65,000 word first novel seemed a manageable task. Writing Regencies enabled me to hone my skills as a writer and to learn the publishing business. Q: Why did you make the switch to epic fantasy and how? Did you find your voice changing between the different genres? A: After writing several Regencies I began to feel frustrated by the confines of the genre. I wanted to explore bigger, richer stories, but my publisher wasn’t interested in letting me branch out. 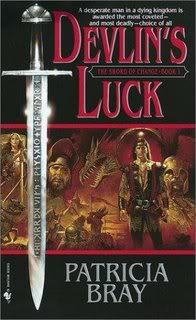 I knew I needed to make a change, so I stole a few months writing time in between my contracted Regency novels and frantically wrote DEVLIN’S LUCK. It was a liberating experience. DEVLIN’S LUCK gave me the freedom to stretch my wings as a writer and tackle a story of epic scope. It’s still recognizably my “voice” but if you compare it to one of my Regencies you’ll see that the differences are in tone and story structure, as different elements are emphasized depending on the genre I’m writing in. For now I’m continuing to write epic fantasy because these are the story ideas that call to me. Down the road I can see myself being drawn to other genres, such as science fiction or perhaps a mystery. Q: Was it difficult to transition from 65,000 word stories to 150,000 words? How did you approach it? A: I made the transition because I wanted to write bigger stories, so switching lengths wasn’t difficult. The longer length allowed me to weave in multiple subplots and introduce multiple viewpoint characters, something that just isn’t possible within the confines of a 65,000 word Regency. It’s like the difference between drawing on a sheet of paper versus having an entire wall to paint–there’s so much more you can do when you have room to spread out. Q: To make matters more challenging, you’ve essentially had to plot out three books for your trilogies. Do you find the roadmap changing as you write the stories, or do you hew fairly closely to your outlines? A: DEVLIN’S LUCK was written as a standalone novel. It wasn’t until I had finished the first draft that I started thinking about potential sequels. When I sent the manuscript to my agent, I included a brief outline for two additional books, and was thrilled when Bantam made an offer for the entire trilogy. DEVLIN’S HONOR and DEVLIN’S JUSTICE stayed very true to my original working outline, which was about ten pages long and included bullet points of key scenes, brief character sketches and a few snippets of dialogue. I often compare outlining a trilogy to planning a trip from New York to Los Angeles. When I sketch out the route, I know that I’ll be driving, who will be in the car with me, and I have a list of the key stops along the way. But I won’t necessarily know all the small towns and roads in between. As long as the key framework is there, I can fill in the supporting details as I go. Q: Could you elaborate on this a bit? Do you feel you’re a hard-core plotter, or more of a pantser? Or both? A: I’m a deep plotter, which means I do a great deal of thinking about the characters and the story before I sit down to write. Before I started THE FIRST BETRAYAL, I knew the opening scene, the ending scene, and all of the major plot twists. As I’m writing the book at any point in time I can tell you where I am in the outline, and I’ll have jotted down a list of the next few scenes that I need to write in order to get to the next bullet on the outline. I also use an ideas file as I’m writing the story, which is the file where I toss in those bits of inspiration that occur in the shower, during the commute, while biking, etc. This file has lines of dialogue, notes on character development, reminders such as “Clerk Ferenc is link back to original scheme” and “land yachts cool, use one in desert scene for book 3?” At the end of the book it’s fun to go back through the file and see how many of these made it in to the final manuscript, and which ones I’ll want to save to use in another book. Q: Fantasy fiction hinges on an authentic alternate reality. What inspires your alternative worlds and how do you go about crafting a compelling one? A: (Russian cover of Sword of Change, left) Like many epic fantasies, THE SWORD OF CHANGE series was set in a medieval world, which felt very much like Northern Europe. It was cold. It snowed. Devlin’s homeland of Duncaer was warmer, but still European in feel. For my new series I decided I wanted a Mediterranean, tropical feel, replacing the ubiquitous rat-infested cities with a lizard-infested city. In this case the setting helps drive the action–sea power is integral to the conflicts between the warring empires. The key to writing fantasy is to get the details right. The reader must get the sense that the world works—that this is a real place that they could step into. Here research is key, whether it is knowing how far a man can walk in a day to how a Renaissance era lighthouse was constructed. If you get the mundane details right, the reader will be more willing to accept the fantastic elements of your story. Q: Do you feel that getting the world right is crucial to the story itself? Does it inform characterization, plot choices, etc.? Or do you get the plot and character down first, then decide what world fits your story? (classic chicken/egg question). A: The world influences the characters and story and vice versa. Ideally they feed off each other until you’ve achieved a meld where the characters are so integrated into their world that changing that world would fundamentally change the story. 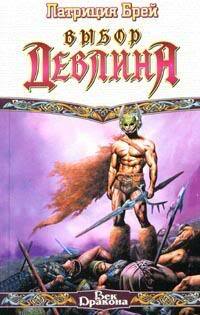 For instance Devlin’s saga required a medieval world. I could set a similar tale in an industrial or futuristic society, but changing the setting would change the nature of the protagonist and how he related to his society, and this would then influence how the storyline unfolded. Here begins Part Two of our interview with author Patricia Bray follows. Bray has managed to leap from category romance to the world of epic, 500-page fantasy novels. Q: The character of Devlin in your first series, SWORD OF CHANGE, was a hard-bitten, cynical man. In your new series, THE CHRONICLES OF JOSAN, the protagonist of Brother Josan is a gentle monk. Did you consciously choose to depart in a different direction for your hero, or was Josan an intuitive choice? A: THE SWORD OF CHANGE series started with the idea of survivor’s guilt, and how someone would respond to being the sole survivor of a vicious attack. Devlin’s character sprang to life from that initial seed, as he is clearly shaped by his experiences. 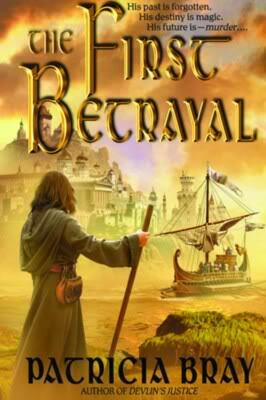 In THE FIRST BETRAYAL, I started with the idea of a man whose memories were not his own. From there I knew I needed a strong contrast to drive the story–Josan, the gentle scholar and his opposite the arrogant, self-centered Prince Lucius. It was an intuitive choice as I kept developing the character until he just felt right. Q: Talk a bit about your female characters. They don’t fit the stereotype of women often found in fantasy literature (healers and so forth). Do you consciously steer clear of Arwen-types or don’t you worry about it? A: I knew when I was writing The Sword of Change series that I wanted a world with gender equality, where both men and women would be found at all levels of society in diverse roles. Part of the fun of the series is playing with reader expectations—as in the second book DEVLIN’S HONOR where we learn that Devlin was the sensitive artist while his wife was the warrior in the family. It’s only after her death that he took up arms and became the hardened warrior that we met in DEVLIN’S LUCK.When I was writing Regencies, my female characters were constrained by the limitations of the genre and the historical time period. When I began writing fantasy, I enjoyed the freedom to create different types of female characters, such as Captain Drakken, the commander of the guard. Originally Captain Drakken was a peer of Devlin, but my first reader kept waiting for me to pair them up, so I added fifteen years to Captain Drakken’s age to make it clear that she was a mentor, not a potential love interest. In my new series I’m using gender roles to help drive the plot. Lady Ysobel is one of the strongest characters that I’ve ever written, and she comes from a culture where women and men have equal status. But in Ikaria women are regarded as inferior beings, and thus despite her diplomatic rank many men refuse to take her seriously. Lady Ysobel uses this to her advantage, knowing that the Ikarian’s prejudices means they will constantly underestimate her. Q: What can you tell us about your new series? Was writing JOSAN easier than writing SWORD? A: The first book begins with the story of Brother Josan, a humble monk whose quest to unlock the secrets of his past inadvertently brings the Ikarian empire to the brink of civil war. As he strives to undo the harm he has caused, his opponents include Lady Ysobel of Seddon, a spy posing as a diplomat, who has been sent to Ikaria to incite rebellion. She and her allies will do whatever it takes to carry out their schemes, while Josan has no one he can trust except himself. THE CHRONICLES OF JOSAN offers a number of challenges because of the intricate plotting, and the fact that action is spread out across the known world. To do this I’m using two primary characters to drive much of the story line—Brother Josan in Ikaria, and Lady Ysobel, who begins by plotting to destroy Ikaria, but over the course of the trilogy will become a reluctant ally. Prince Lucius also has a large role to play, though I don’t want to give too much away for fear of spoilers. Writing the new series is both easier and harder than the first. It’s easier in that I’ve already written one trilogy, so I know I can do this. I know tricks that will help me along the way, such as maintaining an index of people, places, things, so I can ensure consistency between the three volumes and don’t wind up with seven different minor characters each named Thor. It’s also harder in that I am putting pressure on myself to take my writing to the next level—to fulfill the expectations of my fans and make this series even better than the first. Q: What are some of your literary influences? What authors excite you today? A: I read omnivorously, including literary novels, science fiction, fantasy, mysteries, techno-thrillers and the occasional romance. I don’t have much time to read, but lately I’ve found myself reading a number of first novels, and enjoy the opportunity to discover fresh voices. Q: Do you use a critique partner or group, and if so, how do you process their feedback? A: I’ve had the same critique partner for thirteen years. In the beginning our critiques focused on craft—issues such as point of view or overuse of passive voice. Our relationship has evolved over time so now when we critique each other’s work, we’re generally looking for big picture items, such as pacing, or whether a particular scene has hit the right emotional notes. I don’t always agree with her suggestions, but if she tells me a scene isn’t working, then I know I need to do something different. Q: Like many authors, you hold down a day job as well. How do you balance writing and work? A: Balancing my writing with the demands of a full-time career is hard, and often leaves me no time for other things I enjoy, such as reading for pleasure. Most of my writing is done on weekends, or late at night. It helps that I have deadlines to keep me focused—I know that each time I sit down at the computer I have to be productive. Q: What advice can you give to writers who wish to write fantasy fiction? A: If you aren’t reading fantasy, now is the time to start. Read a little bit of everything to get a feel for what interests you, and what has been done before. Find a copy of Diana Wynne Jones’s THE TOUGH GUIDE TO FANTASYLAND for a hilarious look at the cliché’s you’ll want to avoid. Above all, have fun. Don’t try to write fantasy because you think the market is hot. Write because this is what you want to write—what you need to write. Believe in yourself and your story, and readers will sense your passion. Thank you, Patricia! Book One of the CHRONICALS OF JOSAN is available now at all online retailers, including Amazon.com. So I see your new series will be apparently sparse on realism or historical fact. You clearly have no respect for other people’s culture, their past, of keeping to any semblance of historical accuracy with respect to gender issues or the broader implications of how men and women lived in harmony–and still do today. I was just reading through here, and I’m thinking, does this dude realize it’s not the REAL Ikaria in Patricia’s books? I mean, seriously?